Vasconcellos (São Paulo, SP, 1965; Photographer since 1981) has had his images exhibited over 200 times in twenty countries. His series “Nocturnes São Paulo” can be admired alongside today’s renowned professionals in the craft in the pages of “The World Atlas of Street Photography” (Thames & Hudson, England / Yale University Press, USA, 2014). Some of his recent exhibitions are “Past/Future/Present: Contemporary Brazilian Art from the Museum of Modern Art, São Paulo,” Phoenix Art Museum, Phoenix, Arizona, curated by Vanessa Davidson and Cauê Alves (2017); “Collectives,” Today Art Museum (TAM), Beijing (2013); “Itinerant Languages of Photography,” Princeton University Art Museum, Princeton, New Jersey (2013); and “The Vertigo Praise: Itaú Photography Collection,” Maison Européenne de La Photographie (MEP), Paris (2012). The Brazilian photographer has seven books published among them Aeroporto (Ed. Madalena, 2016), Aéreas do Brasil (B.E.I., 2014) and Noturnos São Paulo (2002). 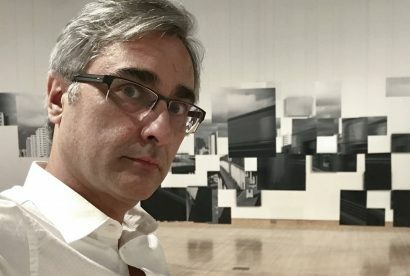 His awards include Conrado Wessel of Art (2011); Paulista Association of Art Critics (APCA – 2002) for best photography exhibition of the year with “Noturnos São Paulo”; Porto Seguro Prize of Photography (2001); and National Art Foundation (Funarte) (1995). The artist’s photographs are in Brazil’s main private collections as well in museums including the MASP – Museu de Arte de São Paulo (São Paulo, Brazil), and abroad in the Bibliothèque Nationale (Paris, France) and the Museum of Fine Arts (MFAH, Houston, US).